You've got your new retina display MacBook Pro? Great. 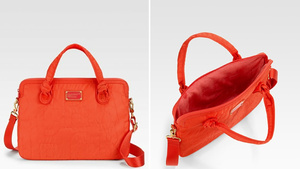 Time to grow up and get a laptop bag that's worthy of it. Fujitsu's original ScanSnap S1300 earned a soft spot in our hearts -- no mean feat for a scanner -- so it's with piqued interest that we catch word of a direct upgrade. 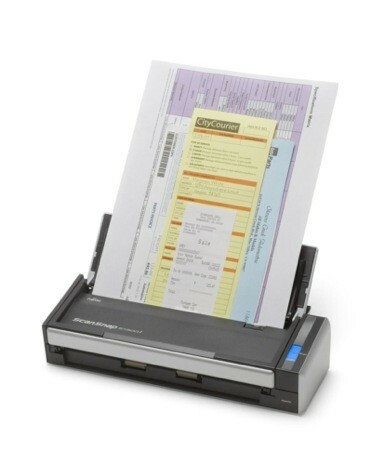 The S1300i is all about serving those of us who might never send scan results to a printer. Android and iOS aficionados now only have to send the results to a relevant mobile app, skipping the usual computer-to-phone shuffle. That stack of receipts can also go skip devices entirely and go straight to the cloud, whether it's Dropbox, Evernote, Google Docs, Salesforce Chatter or SugarSync. However that paper gets converted to digital, it'll be accomplished about 50 percent faster, or 12 double-sided, color pages every minute. All the extras lift the price price even higher, though: $295 is a lot to ask for a scanner. Even so, if that stack of bills is high enough to trigger an avalanche, it might be worth the premium to avoid being snowed in. Fujitsu ScanSnap S1300i delivers scans to Android or iOS, spreads a little cloud love as well originally appeared on Engadget on Fri, 22 Jun 2012 12:54:00 EDT. Please see our terms for use of feeds. 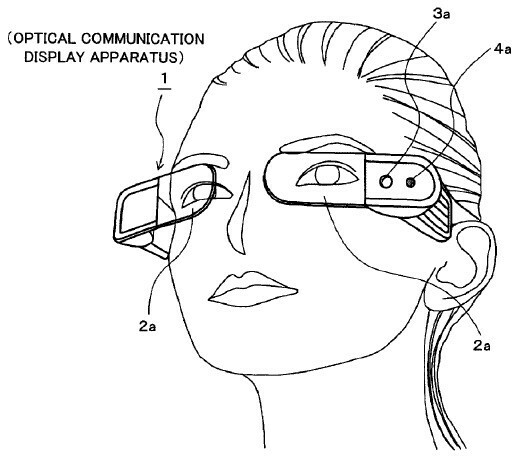 Google might not realize it, but Project Glass isn't alone in the patent race these days. Sony has quietly applied for a patent on a familiar-looking smart glasses system whose advantage over Mountain View would be an emphasis on things in twos. Eyepieces are the most obvious, but Sony is also keen on sharing data between two friends: transmitters on a pair of glasses would send personal info through a likely very uncomfortable glance at someone else with the same eyewear. If your friends are more than a little weirded out from sharing by staring, the proposed glasses could still pick up information from visual tags on posters, products and virtually anything else. There's even the obligatory connection to a watch for sharing data with the rest of the world. Whether or not the patent leads to Sony head-mounted technology more advanced than a personal 3D TV is still up in the air, especially with Google currently hogging the spotlight... not that existing, more conservative designs have ever stopped Sony from rolling out wild concepts before. Sony patent filing for glasses would share data face to face, carry more than a hint of Project Glass originally appeared on Engadget on Fri, 22 Jun 2012 18:11:00 EDT. Please see our terms for use of feeds. There's been a steady flow of betas for Firefox's Android offering and now the official Twitter account promises something "big" on the way next week, along with this image. The size declaration plus a lack of updated features (specifically Flash support) on tablets so far has us looking there for something new, although the image clearly shows a phone with the words "Fast. Smart. Safe." Also curious is an update for the Firefox beta on Android today which the Twitter account also admonishes those looking for an early preview of next week's news to check out. Finally, there's the timing, as Firefox's main browser rival Chrome has been rumored to be taking over as the standard bearer in Android Jelly Bean next week during Google I/O. Leave all relevant speculation or information in the comments below. 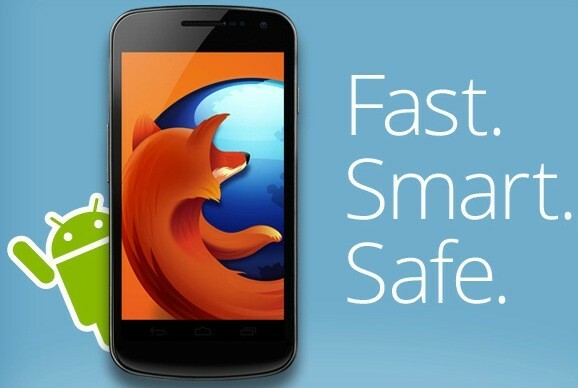 Firefox teases something 'big' coming for Android next week originally appeared on Engadget on Fri, 22 Jun 2012 20:08:00 EDT. Please see our terms for use of feeds. 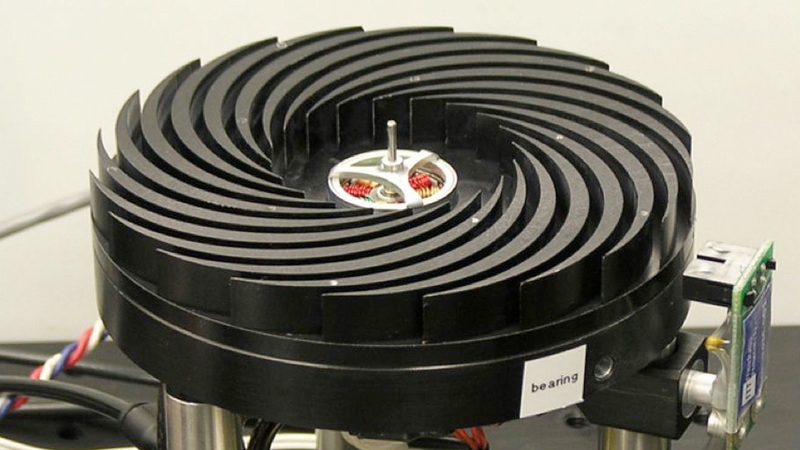 Developing a real, working tractor beam has regularly been an exercise in frustration: it often relies on brute force attempts to induce a magnetic link or an air pressure gap, either of which falls a bit short of science fiction-level elegance. The Technion-Israel Institute of Technology's Mordechai Segev has a theory that would use the subtler (though not entirely movie-like) concept of negative radiation pressure in light to move objects. By using materials that have a negative refraction index, where the light photons and their overall wave shape move in opposite directions, Segev wants to create a sweet spot where negative radiation pressure exists and an object caught in the middle can be pushed around. His early approach would use extremely thin crystals stacked in layers to manipulate the refraction. As it's theorized, the technology won't be pulling in the Millennium Falcon anytime soon -- the millimeters-wide layer intervals dictate the size of what can be pulled. Nonetheless, even the surgery-level tractor beams that Segev hopes will ultimately stem from upcoming tests would bring us much closer to the future that we've always wanted. Negative radiation pressure in light could make some tractor beams real, we're already sucked in originally appeared on Engadget on Sat, 23 Jun 2012 04:18:00 EDT. Pl! ease see our terms for use of feeds. Basketball has found out how to play Moneyball, and they've taken a page out of the Missile Defense Agency's book to do it. Mark Wilson at Fast Company reports how Stats, a company specializing in sports statistics, is using missile interceptor tech to gather reams of data about NBA players and other sports teams. The way that it works is a marvel in itself. Cameras mounted at the top of stadiums are able to track players, identify where they are when they shoot, and then a computer interprets the data to identify where they're successful, when they miss, and where a player is the best at sinking shots. The missile technology comes in when you consider that the system has to track 10 sprinting athletes moving in an unexpected pattern in two dimensional space. 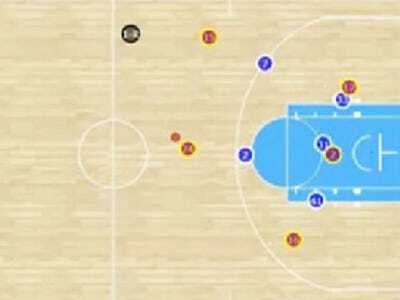 Even more, the system tracks an eleventh body — the ball — through three dimensions of space, identifying anything from a single dribble to a halfcourt shot. Ten teams are using the tech. Oh, and so is the U.S. Military. To track ballistic missiles. And it seems to be working well for the NBA franchises, because four of them made the payoffs, and one — the Oklahoma City Thunder — made the finals. SportVU, initially designed with military tech to track soccer games by an Israeli company, but after they were purchased by Stat, the technology was applied to basketball as well. They're looking into getting it into football stadiums as well. So far, the ten teams have pooled their data so that everyone can peek at everyone else's data. This has allowed individual teams can build research departments and get game-changing insights into how to strategize in a general matter. It is changing the way team strategize. Check out the full story at Fast Company. We don't know much about Eugene Marinelli and Quinn Slack, or their new startup, Blend Labs. But we have heard this much: It has just raised $2.5 million from Facebook investor Peter Thiel and venture-capital firm Andreessen Horowitz, according to a source. It makes total sense, given that Slack and Marinelli are both former software engineers at Palantir, a secretive Thiel-backed company which processes massive amounts of data for corporate clients and government agencies. We couldn't find an SEC filing showing the investment, though there are ways for companies that want to stay stealthy to avoid such filings (by, for example, filing with state regulators). Big data. They just gave a presentation at Stanford about using technologies like Hadoop, HBase, and Scala to handle huge quantities of information. Or as they put it, "you have a ton of data, need to handle a lot of users, and want to perform heavy computation over the data." The social graph. 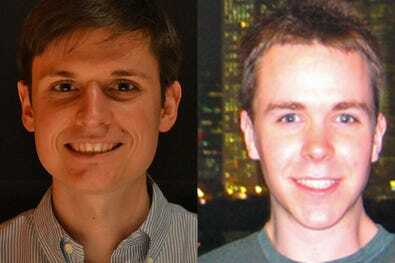 They posted code to GitHub, an open software repository, for "Facebook social data modeling." And their Stanford presentation shows an example of handling data about individuals including email addresses and groups they belong to. Mobile platforms. Slack has contributed some code to the Play 2.0 platform, which is used for mobile applications. Okay, so that doesn't give us many clues to what Blend Labs is doing. But big-data applications for social and mobile platforms seems like it hits just about every investing buzzword. Andreessen Horowitz, Slack, and Marinelli did not respond to emailed inquiries about the investment. ASUS' N- and K-series notebooks may have debuted under the discerning eyes of Milano fashionistas, but it looks like an already refreshed version will arrive in Japan stores first. The ASUS N56VM benefits from recent hardware refreshes from both Intel and NVIDIA, with a Core i7-3610QM 2.3GHz processor and NVIDIA's GeForce GT 630M running the graphics-heavy show. This is joined by a 15.6-inch (1920 x 1080) screen, 8GB of RAM, Blu-ray drive and a 750GB hybrid SSD, while connectivity includes four USB 3.0 ports and a combination memory stick / SD card slot. The notebook is set to arrive this Saturday in Japan, with prices starting from 99,800 yen ($1,240). It's accompanied by two lower-spec K55A and K55VD models, with the major difference between them being the addition of an NVIDIA GeForce GT 610M in the latter. Otherwise, the two pack the same 15-inch WXGA (1366 x 768) screen, Core i5-3210M 2.5GHz processor and 750GB HDD. The laptops also house a pair of USB 3.0 ports, with an SD card slot and a single USB 2.0 port in reserve. The K55A is priced at 59,800 yen ($744), while the K55VD starts at 69,800 yen ($869), with both arriving alongside the N-series model tomorrow. 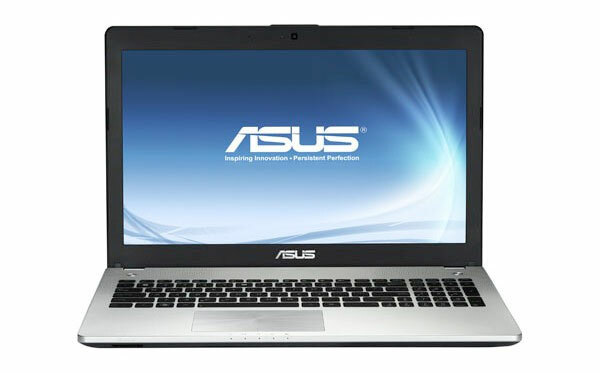 ASUS N56VM laptop gets Ivy Bridge processor, Kepler GPU for Japan launch originally appeared on Engadget on Fri, 22 Jun 2012 08:55:00 EDT. Please see our terms for use of feeds. Solid state drives are the one piece of gear that can turn a dog computer into a cheetah, and it looks like you may not have to scrape much longer to get one. Floods in Thailand made prices for their spinning-plattered brethren climb, but many SSD models like those from Crucial, OCZ and Intel have fallen up to 65 percent in the last year. Lower NAND prices, along with cheaper and better controllers from Sandforce and Indilinx have no doubt contributed to the boon for performance-hungry consumers. All of that means that a 256 GB drive which cost $500+ in June 2011, now runs less than $200 -- and at $.82 / GB, it turns from a near-luxury good to at least a thinkable proposition for many. 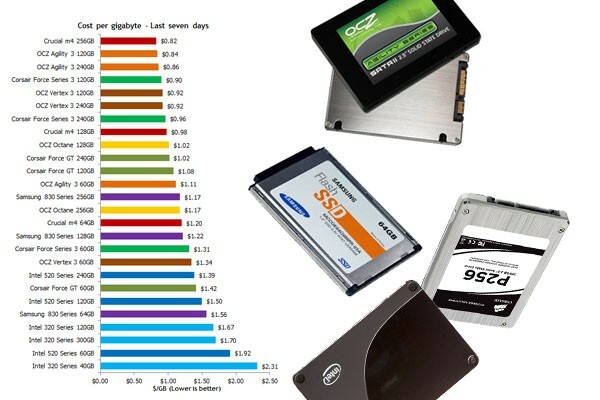 Falling SSD prices might give you a swift boot (up) sooner than you think originally appeared on Engadget on Fri, 22 Jun 2012 09:40:00 EDT. Please see our terms for use of feeds. Facebook has long betrayed you by forwarding your drunken wall ramblings in an email for posterity. Previously, though, the only way to limit further public shame was to try to delete the comment altogether. Now, it looks like the loose fingered have been given a reprieve, as the social giant is rolling out the ability to edit your ill-thought missives long after the fact. Even better, this seems to extend back to those written in the past. Don't think you can be sneaky though, as an "edited" link will appear below, letting everyone see the thread history. So even if you change your opinion, that indecision remains for all to see. Facebook rolls out comment editing, embraces your change of heart originally appeared on Engadget on Fri, 22 Jun 2012 11:24:00 EDT. Please see our terms for use of feeds. Sony is pumping 80 billion yen ($994 million) into its Nagasaki Technology Center, the home of its innovative stacked CMOS. Unlike traditional versions, the image sensor and circuit are mounted on top of one another, rather than side-by-side across a supporting substrate. The tweak means it shaves valuable millimeters from its body while producing far clearer images and, best of all, HDR Video. With the investment (and some Government subsidy) the company aims to pump out 60,000 wafers per month by the end of 2013. Given that both Samsung and Apple both use Sony's imaging equipment in their flagships, we can hope that the 13-megapixel units find their way into the next generation of handsets. 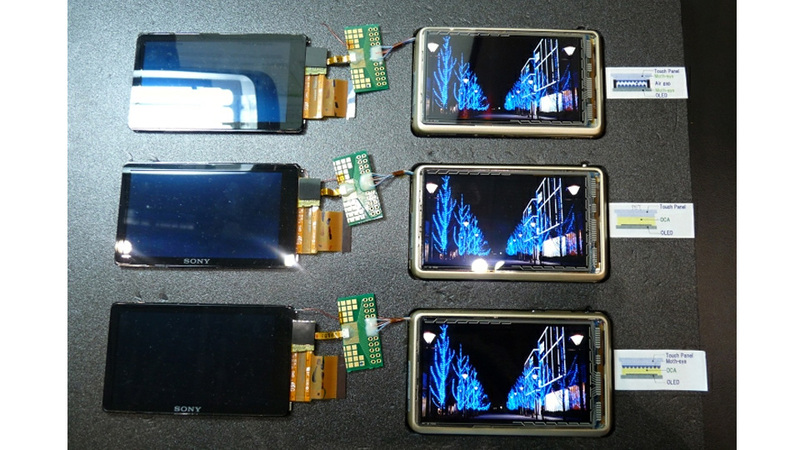 Sony pumps $994 million into building stacked CMOS that lets smartphones record HDR Video originally appeared on Engadget on Fri, 22 Jun 2012 06:57:00 EDT. Please see our terms for use of feeds. Mobile gamers and server pros aren't exactly cut from the same cloth, but Eurocom is targeting them both with its Clevo rebadged, 11.6-inch, sub-four-pound Monster notebook. That idea is crazy enough to work, since a fully spec'd model will have an Ivy Bridge Intel Core i7-3920XM processor, 16GB of DDR3-1600 of RAM, a 240GB SSD or 1GB Hybrid drive, and on-board NVIDIA GT 650M graphics running at 850MHz. The 1366 x 768 screen might be a touch undersized for gamers, but they could let that slide since the processor can be safely overclocked up to a decent 3.8GHz. As for business pros, the company claims the Monster could be used as a portable server, run multiple VMs of Windows and Linux, or high-end engineering apps like MatLab. As usual with Eurocom, you can configure the system in dozens of ways, including matte or glossy screen, Sandy Bridge or Ivy Bridge processors and multiple RAM or disk setups. Pricing and delivery dates weren't given, but if it's up your alley, check the PR and your wallet -- or hit up Ned in accounting. 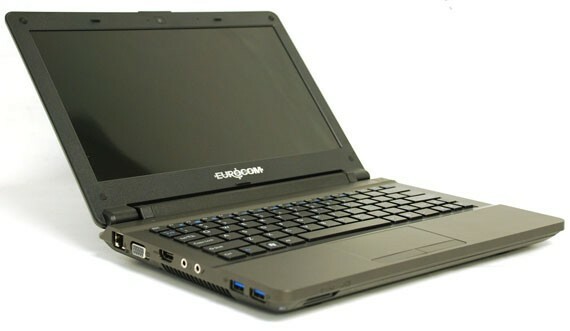 Eurocom Monster 11.6-inch notebook: Ivy! 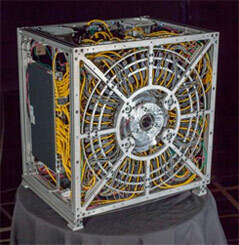 Bridge, Kepler, 16 GB RAM, multiple personalities originally appeared on Engadget on Fri, 22 Jun 2012 07:58:00 EDT. Please see our terms for use of feeds. If Sony manages to perfect its fantastic new low-reflection display coating, one day you may never fear using your touchscreen device in a bright room, too close to overhead lights, or even outside when it's sunny. Because glare will be a thing of the past. 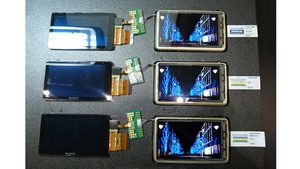 Previously, touchscreen manufacturers have tried to reduce glare on their displays by using layers of different materials with varying refraction indexes. And working together, they help minimize the reflection of external light sources into your eyes. But Sony's new approach involves a special film it's developed that was inspired by how a moth's eyes work. Across its surface is a pattern of microscopic concave and convex structures that serve to evenly bounce light away from the user, reducing glare. And apparently the approach works on an even wider range of wavelengths than the anti-reflective coatings currently in use. 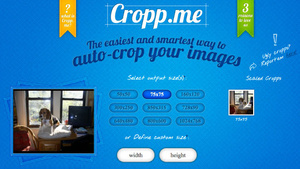 The improvement means less squinting for the user, or having to awkwardly angle their device away from a light source. And since increasing the display's brightness is one way to reduce glare in current devices, it will also let users increase their battery life by turning down their displays. Next step: actually getting this stuff from being just a fancy trade show tech demo to actually on devices. 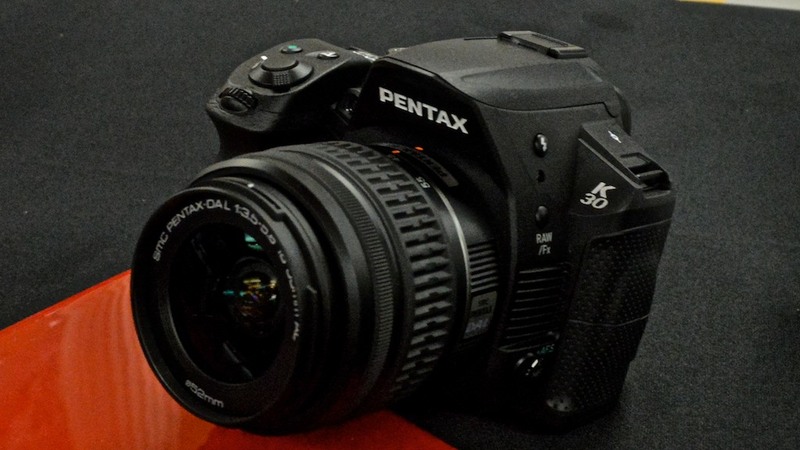 The promise of the new Pentax K-30: The toughest, fastest DSLR that won't break your bank. We just tried it out for the first time, and so far we're impressed. An $850 DSLR body shouldn't feel this good. Lower-end DSLRs can take great photos, but the build quality's usually pretty cheap, and their performance on can be a little sluggish. If you drop them they'll break, and don't expect respond to your every desire. 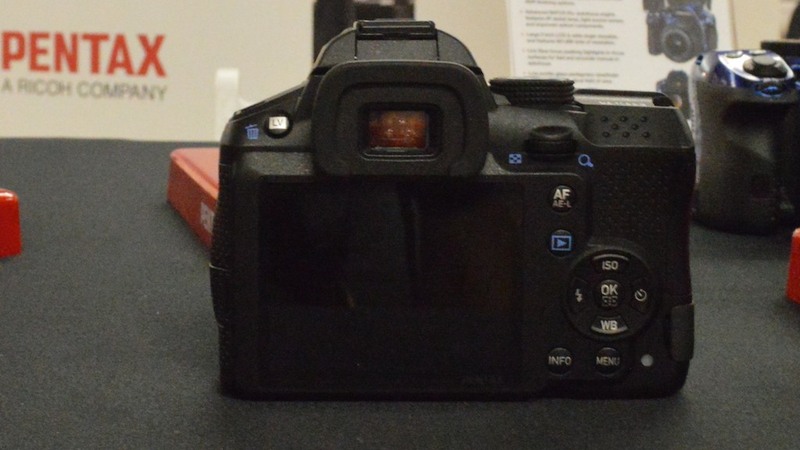 The Pentax K-30 is weather-sealed for "all weather conditions." The company told us it'd be good to go in a monsoon. We didn't get a chance to put the camera under water, but it does feel a lot sturdier than the Nikon D3200 we used to take pictures of it. One detail we didn't notice before is that the cheaper 18-55mm kit lens isn't actually fully weather-sealed—Only the special 18-135mm lens is. Packaged together the lens and camera will run you $1100. That's cheap considering DSLRs can get ridiculously expensive, but it's not $900 like the cheaper kit package. What's really impressive is the camera's performance. It's the fastest we've used in its price range. The camera's autofocus locks on instantaneously, and in continuous mode the camera peels of shots at 6 fps, which is faster than the 5 fps Canon T4i. And make no mistake, the T4i is the K-30 main competitor. Its brand new Live View autofocus should make shooting video a breeze. Plus the T4i's touchscreen controls are the first of their kind on a DSLR. The K-30 and T4i come in at the exact same fully loaded $1100 price, so we'll see if the camera's ruggedness and speed are enough to counter Canon's innovations. 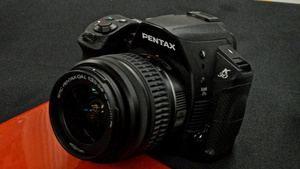 We haven't closely inspected the images from the Pentax K-30, so we don't yet know what kinda of image quality the camera's 16-megapixel APS-C sensor is good for. We'll let you know when we've spent more time with the camera. Gigapixel cameras aren't exactly hot-off-the-presses, but a few wizards at Duke and the University of Arizona may be close to getting that sort of technology into your future point-and-shoot. Reportedly, electrical engineers with gobs of free time and an imagination the size of Coach K's ego have managed to synchronize 98 minuscule cameras -- each with a 14-megapixel sensor -- "grouped around a shared spherical lens". The real kicker here is the hope for the future: these same researchers feel that "within five years, as the electronic components of the cameras become miniaturized and more efficient, the next generation of gigapixel cameras should be available to the general public." The prototype itself measures a whopping 2.5-feet square and 20 inches deep, but only around 3 percent of it is made of optical elements; the vast majority is circuitry needed to calculate the stupefying amount of information captured with such a device. University researchers develop AWARE-2 camera, hope it hits the mainstream in five years originally appeared on Engadget on Thu, 21 Jun 2012 15:51:00 EDT. Please see our terms for use of feeds. T-Mob's variant of the Galaxy S III made its in-store debut on this very day, and we just had a chance to go hands-on with the flagship smartphone. The carrier brought the handset down to the Metropolitan Pavilion for Pepcom's baseball-themed shindig and we just had to get our greasy paws all over its shiny Pebble Blue shell -- and it is a serious fingerprint magnet. Aside from that, though, it's hard to take issue with such a slim and marvelously engineered device. The plasticky build quality does leave something to be desired, but it's something we've become accustomed with Samsung devices. 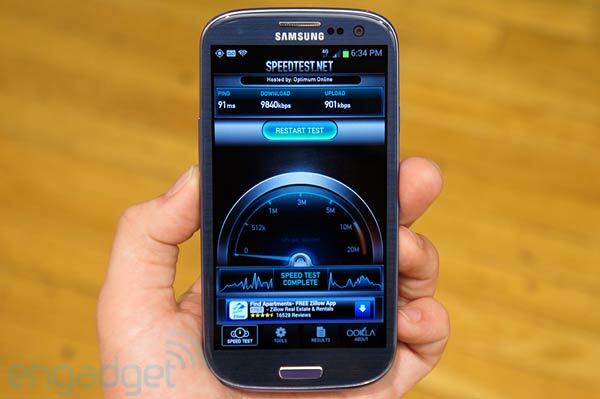 We've also got to give it to Sammy for getting carriers, including T-Mobile, to leave well enough alone. Other than the innocuous logo on the back there are no physical differences between this version of the S III and its 4.8-inch cousins on other networks. There's no keyboard, redesigned corners or rejiggered buttons. Truth is, you'd be hard pressed to tell the difference between Big Magenta's variant and the international version. The only obvious changes come once you fire the device up, and you'll have to dig around a bit to find them. T-Mo has added a few apps to the standard Samsung Suite. Most of them are relatively inoffensive, but if you're the type who was taken aback when you discovered My Verizon Mobile on your LTE Galaxy Nexus, you might not be a happy camper. On board you'll find T-Mobile TV, Name ID, Access T-Mobile, Mobile HotSpot and Visual Voicemail -- pretty standard additions. Our brief time with the device turned up no surprises. Performance was snappy -- apps opened without a hitch and webpages loaded as fast as the congested wireless in the room would allow. If you're a Carly Foulkes fan with an upgrade on tap you could do worse than to pick up the Galaxy S III (which is available today) for $279.99. Though, that price tag is, admittedly, a bit hard to swallow. Be sure to check the video after the break. 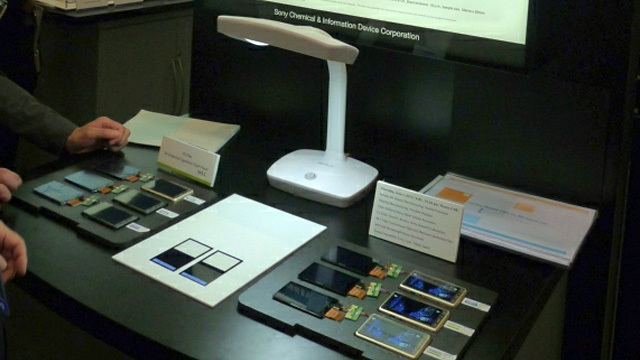 T-Mobile Galaxy S III hands-on (video) originally appeared on Engadget on Thu, 21 Jun 2012 18:33:00 EDT. Please see our terms for use of feeds. If you've been missing out on the graphics card wars of late, then here's a quick rundown. 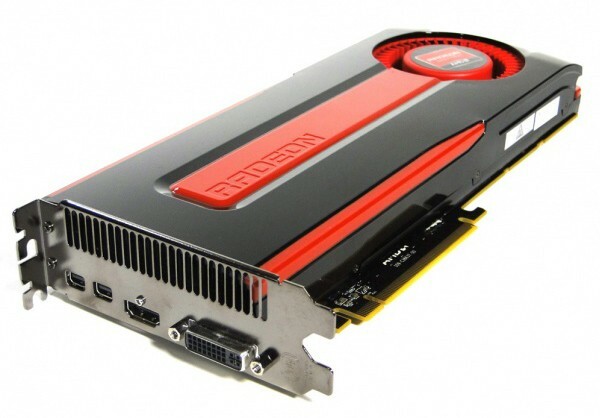 AMD launched its high-end $549 Radeon HD 7970 at the end of last year, and it reigned comfortably for a few months until NVIDIA came out with the masterful GeForce GTX 680. That would have been the end of the matter, at least for this product cycle, except for one crucial factor: time. Having reached the market so much earlier, AMD has now had six months to not only tweak its drivers but also its 28nm silicon. That process has already culminated in 1GHz cards at the low- and mid-ranges, and today it leads to the (slightly predictable) announcement of a Radeon HD 7970 'GHz Edition' -- priced at $499 and expected to be available from a range of board makers from next week. To keep you amused in the meantime, there's plenty of detail in the gallery below and after the break. 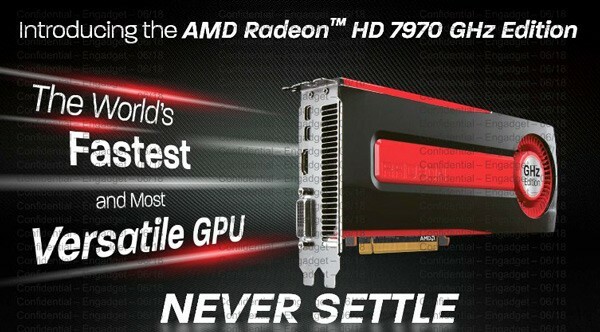 AMD launches Radeon HD 7970 GHz Edition, demands rematch with NVIDIA originally appeared on Engadget on Fri, 22 Jun 2012 00:01:00 EDT. Please see our terms for use of feeds. Who ever said being a scientific guinea pig couldn't be educational? 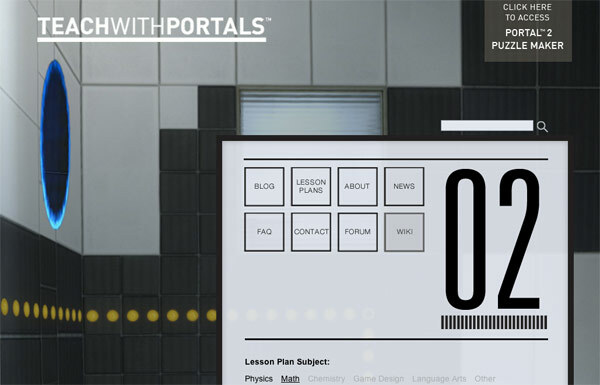 With Steam for Schools, teachers can now use Portal 2's level editor to create lessons focused on boosting critical thinking, spatial reasoning and problem solving skills. Announced at the Games for Change festival in New York City, the educator edition of Steam comes with a free copy of Portal 2 and the Portal 2 Puzzle Maker. Students and teachers alike can use the tools to create puzzles, but distribution is handled by teachers alone. (That's right, kids -- no level sharing unless the teach says so.) An accompanying website serves as a gathering place for teachers to collaborate, and aims to provide sample lesson plans centered on science, technology, engineering and math. If you're an educator who can't wait to bring a Portal-assisted physics lesson to life, see the links below to sign up for the ongoing beta. Now if you'll excuse us, we're off to "study." Valve announces Steam for Schools, helps teachers create educational Portal 2 levels originally appeared on Engadget on Fri, 22 Jun 2012 05:21:00 EDT. Please see our terms for use of feeds. 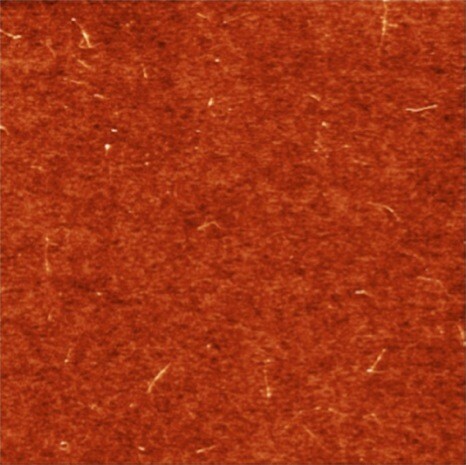 What's this orange-like patch, you ask? It's a layer of carbon nanotubes on silicon, and it might just be instrumental to getting a lot more power out of solar cells than we're used to. Current solar power largely ignores near-infrared light and wastes about 40 percent of the potential energy it could harness. A mix of carbon nanotubes and buckyballs developed by MIT, however, can catch that near-infrared light without degrading like earlier composites. The all-carbon formula doesn't need to be thickly spread to do its work, and it simply lets visible light through -- it could layer on top of a traditional solar cell to catch many more of the sun's rays. Most of the challenge, as we often see for solar cells, is just a matter of improving the energy conversion rate. Provided the researchers can keep refining the project, we could be looking at a big leap in solar power efficiency with very little extra footprint, something we'd very much like to see on the roof of a hybrid sedan. All-carbon solar cell draws power from near-infrared light, our energy future is literally that much brighter originally appeared on Engadget on Fri, 22 Jun 2012 05:52:00 EDT. Please see our te! rms for use of feeds. You know the routine: we looked this revamped card's spec sheet a few hours ago, so now it's time to find out how it fared in independent tests and whether it's worth the $499 outlay. On the face of it, this powerhouse of a card ought to be a champ, since it comes $50 cheaper than the original's launch price (although that non-GHz Edition has now dropped to $449) and brings crucial improvements in clock speed and memory bandwidth. In practice? Well, it wins -- but only on points. Read on for more. AMD Radeon HD 7970 GHz Edition review roundup: a big, bad bruiser of a graphics card originally appeared on Engadget on Fri, 22 Jun 2012 06:12:00 EDT. Please see our terms for use of feeds. Imagine if when you sat down at your computer it recognized you and unlocked all of your web accounts. No more logging in to anything. That's the promise of this new app by Ford. Yes, the car company. Like other companies Ford has been using NFC keys for a while. When you're close to your car, it unlocks. So easy. Now the company has created Ford Keyfree, a Chrome extension which does essentially the same thing for your passwords. Your "key" is your smartphone. When you're close to your car, your phone talks to the Chrome extension via Bluetooth and automatically enters all of your passwords. When you walk away, the extension logs you out. Brilliant. Ford Keyfree is a slick, intelligent piece of work. It turns out Detroit CAN innovate. As you can see from the video above it's obviously a marketing gimmick, and there are some practical security concerns. Isn't it kind of weird that all someone needs to get into my sensitive accounts is my phone? What's the proximity radius? Furthermore, since the app uses Bluetooth, it'll put a strain on your battery. 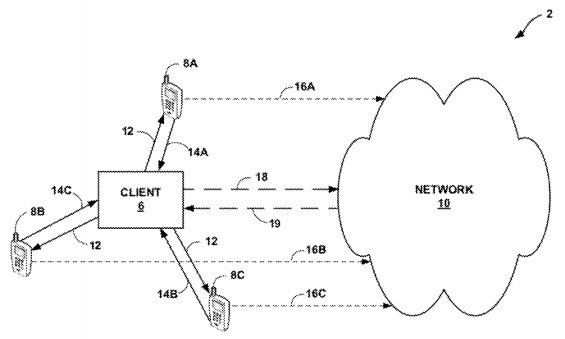 Google files for a patent on peer-to-peer location fin! ding, sa ys cell tower triangulation is for chumps originally appeared on Engadget on Thu, 21 Jun 2012 11:42:00 EDT. Please see our terms for use of feeds.